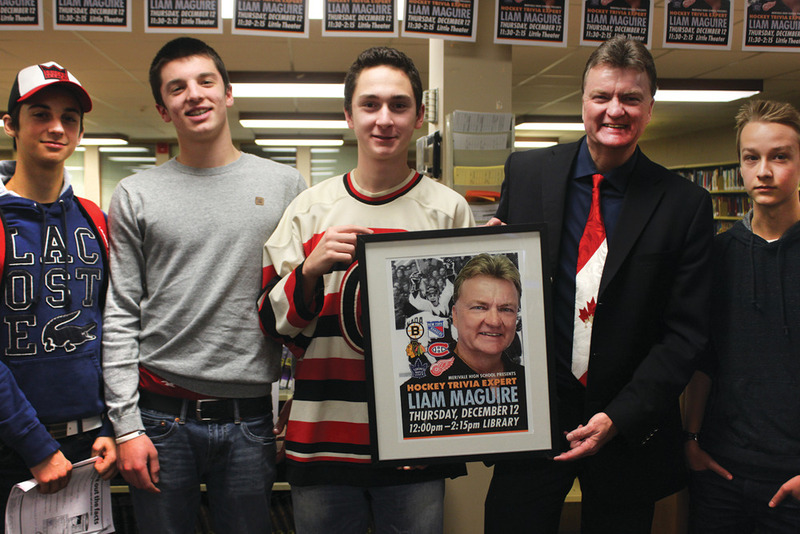 From December 11 through December 18, the Merivale Library celebrated Hockey Week with a series of activities, displays and speakers. Several recently published titles were added to the collection, including the Prime Minister’s A Great Game, recounting the early history of professional hockey in Toronto, Dave Bidini’s, Keon and Me, Bobby Orr’s new biography and Nos Glorieuses, Lynda Baril’s wonderfully illustrated history of women’s hockey in Québec. 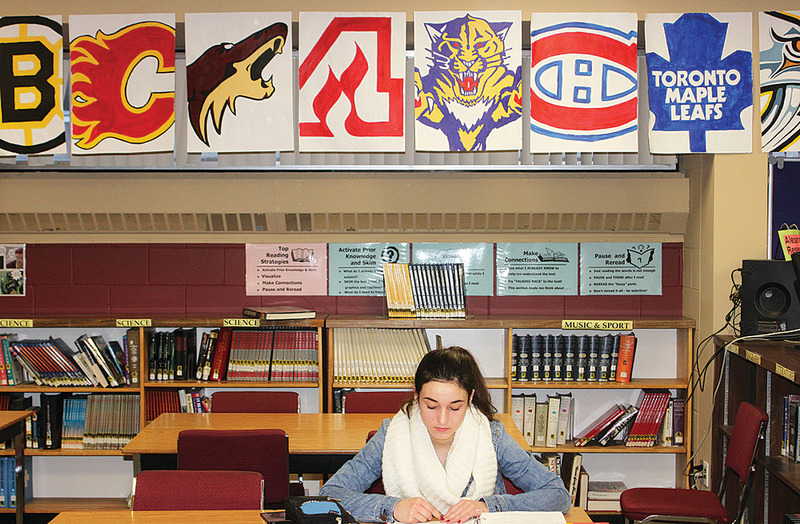 PDF Hockey Curriculum Links on a wide variety of topics were posted to the school’s staff conference, to allow teachers to take advantage of a variety of approaches to incorporate a bit of hockey into their lessons. Our Vice Principal Tim Hawes helped set the tone for us by substituting the regular national anthem for the amazing rendition by the late Roger Doucet at the old Montreal Forum. It was played every day during Hockey Week. Our French teachers loved it. Doucet gained a lot of notoriety for his treatment of the Soviet, Swedish, Finnish and Czeck anthems as the game moved to more international play. Merivale’s teaching staff was encouraged to join the festivities. 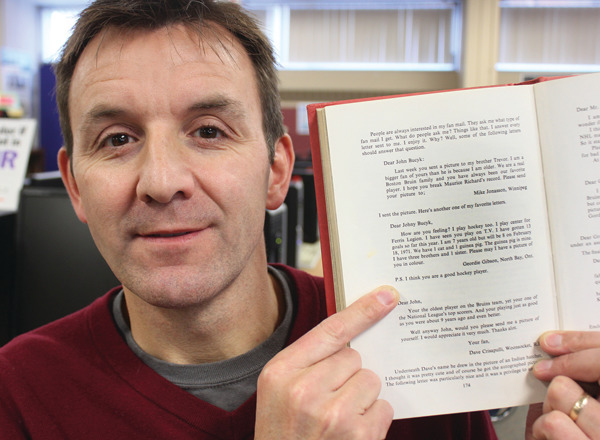 Science teacher Geordie Gibson shared a letter to his boyhood hero Johnny Bucyk that was published in the legendary Bruins’ autobiography, and math teacher Alison Lane let students know that she recently married the grandson of 1930s NHL Sens goaltender Bill Beveridge. Not to be outdone by colleagues, hockey coach Bill Lister revealed that he played a season with the Junior A Gloucester Rangers! 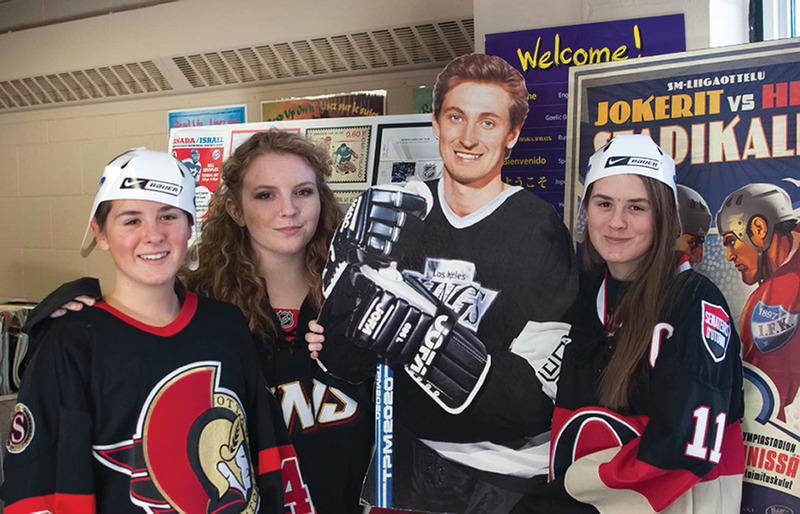 A cardboard cutout of the Great One provided a terrific photo op for students, and aspiring sports journalist Carlos Verde posed for a special Hockey week bookmark that was distributed to staff and students. 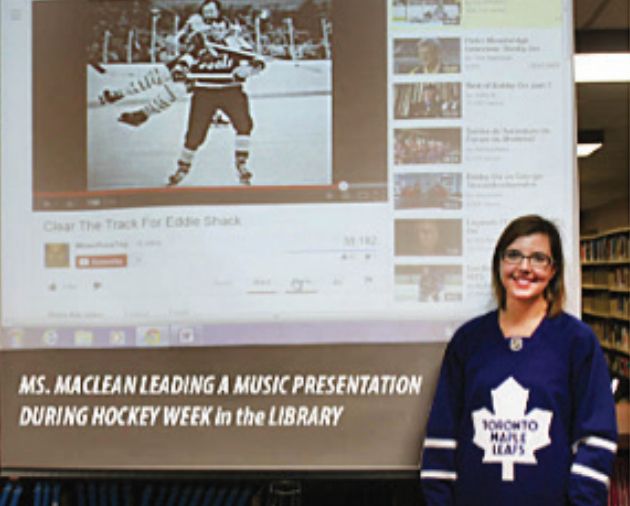 Music Teacher Tessa MacLean—unquestionably the biggest Leaf fan at Merivale—proudly wore her blue jersey, and played a noon hour concert of hockey tunes that covered everything from the Dolores Clayman’s iconic Hockey Night in Canada Theme, to Stompin’ Tom’s Hockey Song and the clever 1960s hit, Clear the Track, Here Comes Shack. The Languages Department’s Robert Duquette happily reprised his role as the Rocket, posed for pictures and signed quite a few autographs after a screening of the National Film Board’s animated classic The Hockey Sweater. 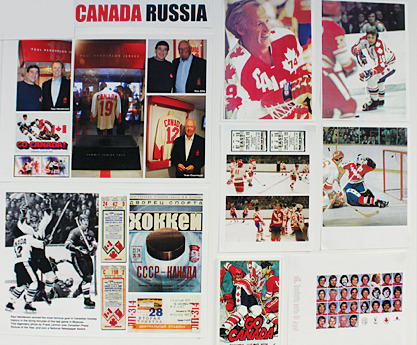 Several examples of the impact hockey has had on the international front were also on display, including a feature panel about the 1972 and 1974 Canada Russia series. 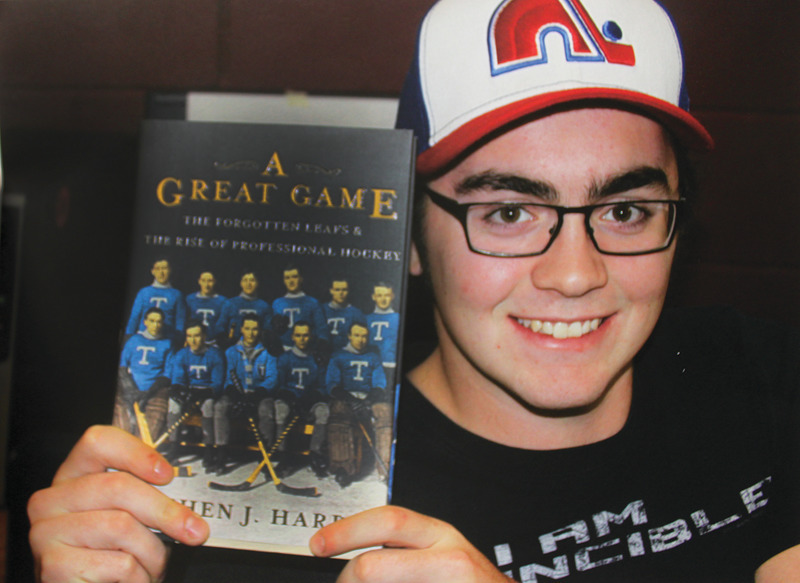 The highlight of the week was a visit by hockey trivia expert Liam Maguire who in the course of an afternoon in the Library, amazed students and staff with his uncanny memory and knowledge of the game. Maguire fielded questions from staff and students with ease, and also encouraged students to use some of his techniques when preparing for tests and exams. The purpose of this seven-day special event was to show students that the game is an important part of our history and culture and that musicians, artists, authors, teachers and prime ministers have each responded to the impact our national pastime has had and continues to have on our country. Irv Osterer is a Teacher Librarian and Department Head of the Fine Arts, Computer Studies, Technology, Communication and Design FOCUS program at Merivale High School in Ottawa, ON.